When working with SQL queries, either within your php code or when testing or toubleshooting errors via your phpMyADmin, it is helpful to understand the structure of the table you are writing to. If you are updating or adding new rows to tables, you will most definitely need to know the correct data type of the data fields. Attempting to add a value of one data type to a field that is expecting another can result in a syntax error. This guide will show you how to find the correct data type for data fields (columns) via phpMyAdmin. First, log into your cPanel interface. 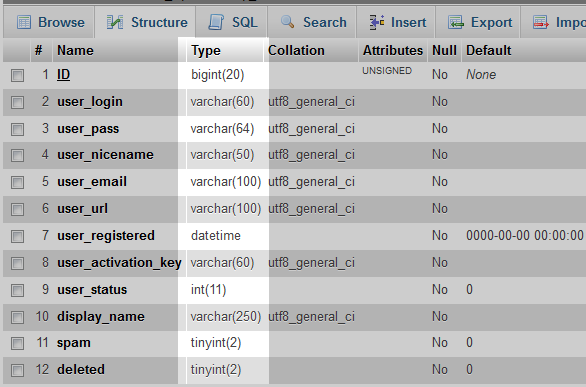 Locate the Databases category and click on the phpMyAdmin icon. 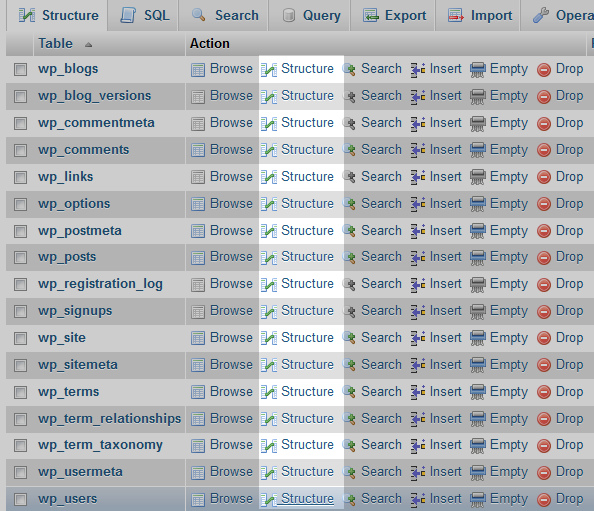 Once on the main screen for phpMyAdmin you will see a list of databases in the left hand side panel. Click on the database you want to work with. The next screen displays the table names for the database in both the left hand and right hand panels. Look to the right hand panel and locate the table you will be working with. Next to each table are several links. Click on the Structure link for your table. 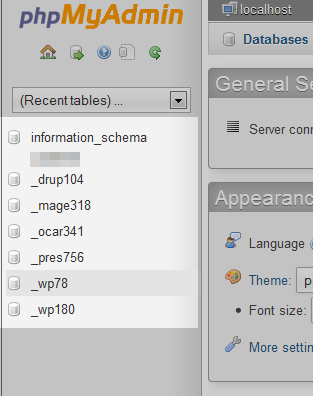 For our example, we will be looking into the wp_users table. You are now taken to a screen that displays the data columns and their details for the selected table. Looking at the labels across the top, you will notice a column named Type. This column lists the data type for the data fields. Most of the types have a number after the type. This is the maximum number of characters the field will allow. For example, VarChar(255) means it is a varChar field (alphanumeric) and can have up to 255 characters.